The National Bar Association (NBA) was founded on August 1, 1925, in Des Moines, Iowa by 120 lawyers to give voice to black attorneys who were excluded from every nationally organized bar association at that time. When the association was formed, there were slightly less than 1,000 black lawyers throughout the United States. The NBA addressed issues such as professional ethics, legal education, and uniform state laws, as well as questions concerning the civil rights movement in transportation discrimination, residential segregation, and voting rights. Many lawyers were also members of the National Association for the Advancement of Colored People (NAACP) because the NBA did not directly participate in civil rights activities. NBA attorneys instead worked through the NAACP to argue civil rights cases and supported other civil rights groups by offering information on a specific point of law or by filing amicus curiae briefs. The NBA also sought to influence the composition of the judiciary by opposing nominees to the federal courts who opposed racial equality. In 1930, for example, the NBA helped block the appointment of controversial North Carolina judge John J. Parker by President Herbert Hoover to the U.S. Supreme Court because of his outspoken opposition to civil rights and voting rights for African Americans. By the mid-1960s the NBA also addressed constitutional civil rights issues involving prisoners and criminal defendants and set up free legal clinics in impoverished African American neighborhoods. In 1968 the Association helped to found the Council on Legal Education Opportunity (CLEO), in an attempt to increase African American enrollment in law schools. CLEO offered financial assistance and gave summer institutes for African Americans and other people of color who were entering law students. The NBA was also a leader in gender equity among black attorneys. In 1928, Georgia Jones Ellis became the first woman officer in a bar association in the United States. In 1981, the NBA elected its first woman president, Arnette Hubbard. Even after 1943 when the American Bar Association finally accepted black members, the NBA remained the primary organizational vehicle for the vast majority of black attorneys. In 1968, however, the NBA faced its first serious challenge. 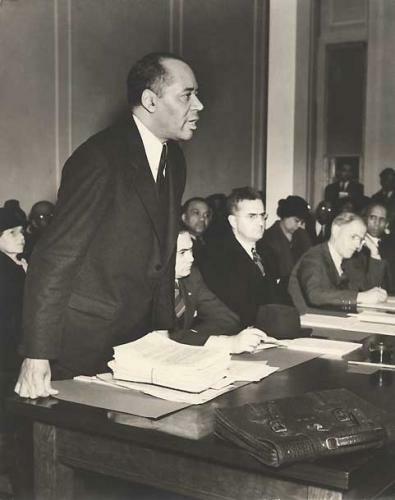 The National Conference of Black Lawyers (NCBL) was created that year to become more active in the ongoing civil rights effort and to aid the working class. Many NBA members joined the NCBL. Nonetheless the NBA remains the largest black bar association in the country with over 20,000 lawyers, judges, educators, and law students. http://www.nationalbar.org/nba/index.shtml Nina Mjagkij, Organizing Black America: An Encyclopedia of African American Associations (New York:Garland Publishing, Inc., 2001).